With peach season upon us and Apple, pear, and pumpkin season just around the bend, Pie season is just beginning! Nothing is better than homemade pie crust, right? 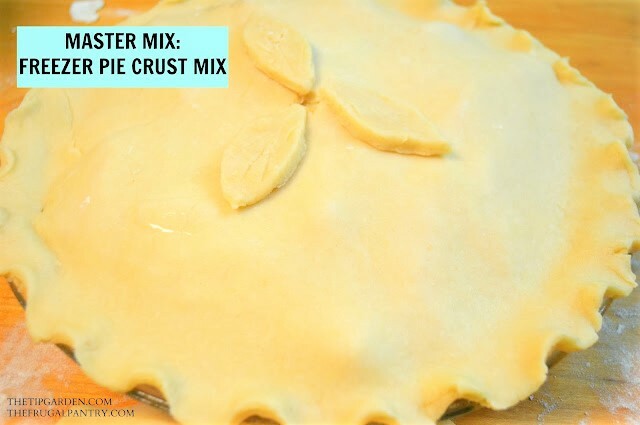 This Master Mix recipe will let you whip up a batch of 7 crusts at one time to store in the freezer so all you have to do is thaw, roll and bake! All the goodness of your homemade, from scratch crust, with all the convenience of a premade crust! Today we are making a bulk recipe that you can store individual ball of pie dough in your freezer, ready to thaw, roll out and bake! You will make up to 7 pie crusts at once and have almost a full year to use them! So I am dreaming of pot pies with left over turkey, chicken, or beef, quick fruit pies, or shells for dreamy banana cream or chocolate pie! In a heavy duty mixer (or in a large bowl with a pastry blender) combine flour and salt. Add in shortening and blend till mixture resembles a crumbly cornmeal texture. Add in 1 1/4 cups water. Mix lightly until water is absorbed and mixture forms a ball. If necessary add additional water. Divide dough into 7 portions. Shape each portion into balls. Place each ball into a freezer storage bag, or airtight container, or wrap in freezer paper. Label each package and date. Roll out and use as desired.